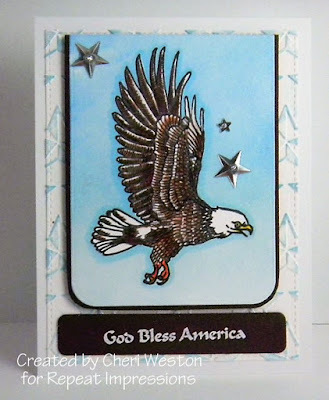 Hello there House guests.....we've got a bonus Wednesday challenge this month (since there are 5 in this month) and it's an the ever popular Anything Goes challenge at The House That Stamps Built. Cut your artistic, crafty spirit loose and join us. It's always fun to see what ends up in the links. As we soon will be celebrating our American birthday on July 4th, the card I created was inspired from watching the videos of the magnificent American bald eagle, "Challenger" soar through stadiums and across fields for American celebrations and remembrances as the National Anthem is played. You can find his videos on YouTube. Here's one clip. Challenger was blown out of his nest when he was an eaglet. Some well meaning humans kept him and took care of him. However, he was human imprinted and was never able to be reintroduced into the wild. He's the only eagle in the U.S ever trained to fly at such events. Quite a story and I always get all choked up when I see him do this with the music of our National Anthem in the background. He's named after the space shuttle "Challenger" which disasterously exploded after take off in 1986. I hope you'll come over to The House and play along with our Anything Goes Challenge - details of how to enter and what you could win are found there. Oh how beautiful and just in time for our nation's holiday. Perfect card for the upcoming celebration on the 4th! Nicely done, Cheri. Such an interesting story and a gorgeous card beautifully designed and colored! Beautifully done, Cheri. Happy 4th to you and yours! Beautiful card, my friend, and what a touching story. The Challenger happened on our daughters' 5th birthday. Terrible tragedy. Thank you for being such a thoughtful person! Hugs...! This is gorgeous!! What a fabulous image and your coloring is beautiful! Love the CAS layout; it's perfect!